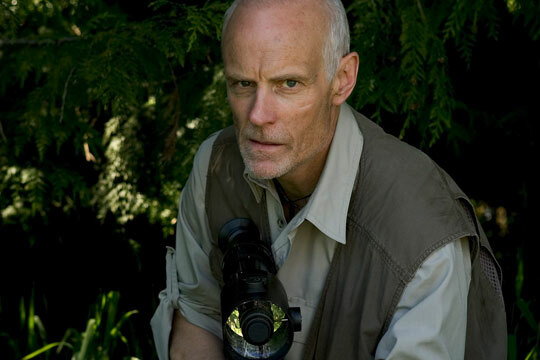 From Sci-Fi time traveller to a digitally enhanced artificial intelligence and even Sherlock Holmes, actor Matt Frewer has over the years brought these and many other characters to life in theaters as well as feature films and on TV. There is one role, though, he once longed to play but never had the chance to do so. And it was a role that would have taken him in a totally different direction as far as his professional life. 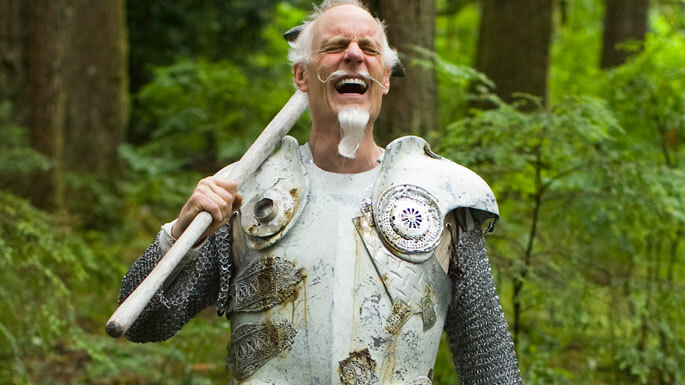 “The While Knight is kind of a cross between Baron Von Munchhausen, The Cowardly Lion and Don Quixote,” explains the actor, taking a break during filming last summer in Vancouver. “The idea for Alice sounded intriguing to me, and then I was completely sold on it when I read the script. The story, which is absolutely delightful, was written by Nick Willing, who’s also our director, and he has come up with some amazing characters. “I have to say that this role has sort of fit me like a glove, so it hasn’t been much of a stretch to play. We’ve got this wonderful Salvador Dali-type beard and mustache that I wear, and that’s been a bit of a challenge, especially when it’s hot out because the glue starts to come loose. So there’s that business of people futzing with you right up until the moment that the cameras start rolling. You being to feel like a Christmas tree being continually dressed,” jokes Frewer, “but other than that the character has been a joy to play. In Alice, the White Knight crosses paths with Alice Hamilton when she comes to Wonderland to search for her lover, Jack Chase (Philip Winchester), who has been brought there against his will. He joins the Hatter (Andrew-Lee Potts) in helping Alice find Jack, and in the process, the three of them also risk their lives to help oust Wonderland’s ruler, The Queen of Hearts (Kathy Bates) and break her stranglehold on the kingdom. 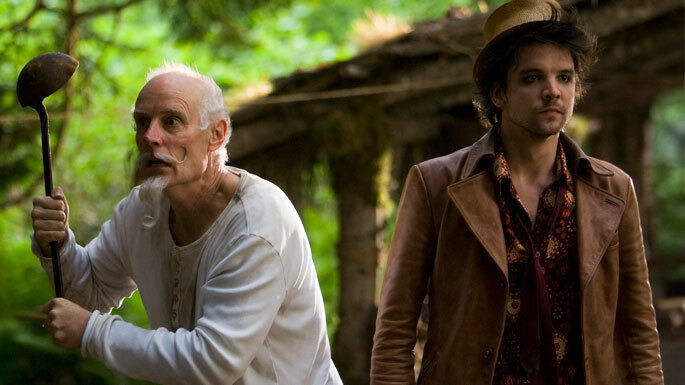 “The two characters that the White Knight relates to almost solely in the story are Alice and Hatter,” says Frewer. “He comes cross Jack in a couple of scenes, but most of my onscreen time is spent with Caterina and Andrew. There is kind of a begrudging friendship and respect for one another that evolves between my character and Hatter. 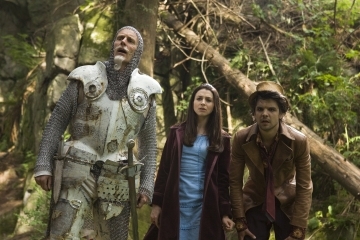 And with Alice, I think the White Knight is more or less a temporary Wonderland father while she’s there. 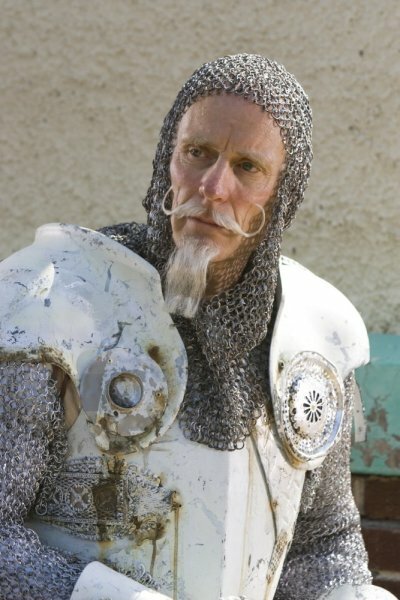 What were some of the challenges the actor found working in his White Knight attire? “The first day of work on any new job is usually pretty chaotic, and in this case it was particularly so for me because they had only just begun to put my costume together,” he recalls. “It included a huge breastplate, chain mail and all the various other accouterments that a knight would wear. The breastplate was cumbersome to say the least. We ended up calling it the Volkswagen,” chuckles Frewer. “I then began to realize how hot it was going to be lugging this thing around, especially on-location, because it’s basically like being cooked in your own soup can. Frewer credits the show’s cast and crew, in particular, Nick Willing, with making Alice such a positive experience for him. “Nick is a real visionary,” says the actor. “He’s a little bit like the White Knight in that he’s slightly ‘mad,’ but in a wonderful way, as well as a very warm, gentle, kind and witty guy. That is all an added bonus on top of the fact that he is also a huge talent. You don’t often find that combination. “Andrew and Caterina are a blast as well to work with. Caterina is a real find for Alice. She’s so much like her character and is an open book. Caterina is, I think, one of those actresses who has such an immediacy onscreen. Whatever scene she’s in, she’s right there and reacts to it immediately. And like I said, her face is an open book, and she’s an extremely tender, sensitive soul and isn’t afraid to show that. Caterina also has this kind of tough curiosity about her. Such a combination is perfect for Alice, and I think she has knocked the whole thing out of the park. “As for Andrew, he’s terrific, too. He’s from the north country in England, a place called Bradford, and he has sort of a tough guy swagger, but he’s very sweet as well. I think the girls are going to love him as Hatter. Andrew has this fantastic onscreen chemistry with Caterina, and hopefully audiences will go with that and be rooting for their characters to end up together. 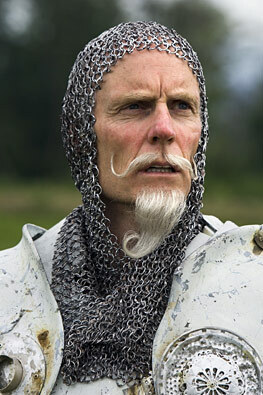 Born in Washington, D.C., Frewer trained at the Bristol Old Vic Theatre School and graduated from its three-year acting course in 1980. One of his very first roles was in the 1983 film Monty Python’s Meaning of Life. “There was a piece before the main film called The Crimson Permanent Assurance and it was sort of a pirate spoof where a group of young office workers were defending their building against a group of older ones,” says the actor. “The older office workers would pull up alongside what looked like a Spanish galleon, swing through the windows and take on all the young office workers. One of the older pirate guys corners my character by a window, I yell, ‘S**t!’ and jump out the window. That was my first professional experience in front of the camera. All I can say is thank God for all that classical training,” he jokes. A few years later, the actor became a familiar face, of sorts, around the world with his portrayal of a fictional British artificial intelligence in the TV series Max Headroom. “That was kind of a short sharp shock,” notes Frewer. “Originally, Max was meant to be this computer-generated man/video disc jockey and we perpetuated that ‘ruse.’ Then we realized the only way we’d be able to achieve the look and effect of such a character was to put someone in rubber make-up, and that guy ended up being me. Besides his work on Max Headroom, Frewer has guest-starred on such shows as Robin of Sherwood, Miami Vice, Star Trek: The Next Generation, The Outer Limits and Intelligence. He also had a regular role as Matt Praeger in Psi Factor: Chronicles of the Paranormal, and currently plays the recurring character of Jim Taggart in the Syfy Channel series Eureka. The goal of most actors is to be able to practice their craft in as wide a range of projects as possible, and for Frewer, the wider the better. “I think the measure of success for an actor is that you can be on your deathbed – which hopefully comes later rather than sooner – and look back over your career and say that you did plenty of diverse and interesting things, as opposed to how much [money] you took to your grave,” he muses. “After all, what are you going to do? Get a more expensive lining for your coffin. The concluding two hours of Alice airs tonight, Monday, December 7th starting at 9:00 p.m. EST on The Syfy Channel. As noted above, all Alice photos by James Dittiger and all photos copyright of The Syfy Channel, so please no unauthorized copying or duplicating of any kind. Thanks! This entry was posted on December 7, 2009 at 6:30 am and is filed under Uncategorized. You can follow any responses to this entry through the RSS 2.0 feed. You can leave a response, or trackback from your own site.